The fallout from Fukushima continues. Concerns about an effort by Italian Prime Minister Silvio Berlusconi to revive his country's nuclear power program helped drive millions of Italians to the polls June 13, when they voted overwhelmingly to block any such revival amid safety concerns following the meltdown in March of the Japanese plant. Berlusconi's name didn't appear on the ballots, which also offered voters the opportunity to overturn laws governing the privatization of water and a controversial measure protecting top government officials from prosecution. But it might as well have. Italy's law on referendums requires more than a 50% turnout in order to overturn legislation. And while the opposition framed the vote as a referendum on the way the country is being governed, Berlusconi spent the days leading up to the polls challenging the nuclear power measure in court, declaring he wouldn't vote and suggesting his fellow Italians stay at home too. "This vote was a mix of policies and politics," says Roberto D'Alimonte, a professor of political science at Rome's LUISS University. "It was about the issues, and it was about delivering another knockdown to Berlusconi." The result was seen as an overwhelming rebuke to a man who has spent his career conflating the personal with the political. Some 57% of voters in Italy went to the polls, with roughly 95% voting to strike down the various laws. It was the first time the 50% threshold had been breached on a referendum since 1995. The Prime Minister's defeat is the latest in a yearlong series of setbacks and humiliations, in which he has seen his closest ally defect from his party, been brought to court on charges of juvenile prostitution and steadily seen his poll numbers slip. Two weeks ago, his ruling coalition suffered a resounding defeat in local elections, including in his political stronghold of Milan. While the most recent referendum is unlikely to have an immediate impact on the ability of Berlusconi to keep his ruling coalition together, the results are sure to reinforce his image as a politician clinging to the last months of his career. Measures Berlusconi introduced when his consensus was strong are now weighing him down. 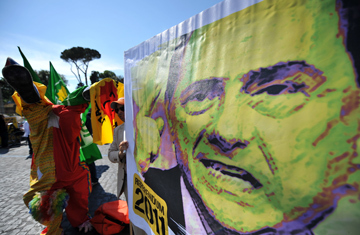 In 2008, the Prime Minister overturned a 1987 decision during a similar referendum in which Italy's voters ordered a halt to nuclear-energy production and the phasing out of the country's existing power plants. In the wake of the meltdown in Fukushima, Berlusconi issued a one-year pause in Italy's renascent atomic-energy program, but he also indicated he planned to reactivate it when passions cooled. The June 13 referendum results put the country's nuclear power industry back in cold stasis. Italy wasn't the first European country to rein in its nuclear ambitions. Switzerland passed a moratorium on reactors shortly after the Japanese meltdown. And last month Germany decided to speed up a phaseout program for its aging plants. But the June 13 vote showed, in typically Italian style, how an important energy issue can easily become mixed up in national politics. "This was a vote for democracy," said Nando Bonessio, head of the Green Party in the Lazio region of Italy, who had gathered with members of his party outside the Pantheon in Rome to carve up a giant cake with a picture of a smiling sun on it. "Berlusconi needs to consider the consequences." Also overturned was a law protecting top government officials from prosecution, which Berlusconi has argued is necessary to protect him from a politicized judiciary. The legislation had already been partially struck down by the Constitutional Court, but its complete elimination leaves the Prime Minister even more vulnerable to prosecution. For his allies in the right-wing Northern League, which also suffered heavy losses during the recent local elections, the question will increasingly become whether sticking with Berlusconi as a coalition partner is worth the cost to their popularity or whether they'd be better off bringing down the government and heading back to the polls. "If you're a Berlusconi supporter in Parliament and you think he's weak, you start looking for alternatives," says D'Alimonte. "The Northern League is already very uneasy with its relationship with Berlusconi." The magnitude of the defeat calls into question whether the Prime Minister's greatest strength  his control of a wide swath of his country's media  has been undermined by the explosion of social media in Italy. Berlusconi's campaigning during the local elections had drawn the ire of Italy's communications regulator, which fined five television programs for giving the Prime Minister a disproportionate amount of airtime. Meanwhile, the candidate he was campaigning against in Milan was trending on Twitter. During the run-up to the referendum, the opposition relied heavily on the Internet to mobilize the country's voters. "Italians are rediscovering grass-roots campaigning, and social media are a part of it," says Bernhard Warner, director of Custom Communications, a London-based social-media consultancy, who says that when he was in Rome he was approached in the park by activists on bicycles and handed a flyer with links to further information online. "You had the grass-roots bike brigade, and you had the Facebook and Twitter element to it as well," says Warner. "This is the kind of force that Berlusconi just cannot combat anymore. All his eggs are in the traditional-media basket." As always with Berlusconi, the question now becomes whether this latest meltdown will be his last.